So finally to our Real Life O body shape. to see how they had photographed, and I noticed that their models didn’t have bras on! As I’ve repeatedly said, a well fitting bra can give you the illusion of more of a waist, so these photos are not as obvious as ones without bras would be. Here are two examples of Os, the one on the left used to be an X shape when she was slimmer, but now is carrying weight through the upper body, the one on the right may tend toward more of an A or 8 shape (though I’m really not sure). 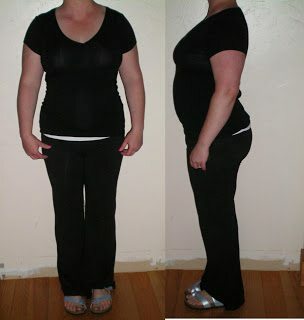 Here is a combination V and O shape – from the front we see she is top heavy and shoulders are broader than hips, from the side it’s all O (she’s had 5 kids, the last one less than a year ago), and she told me this was her sucking in her stomach and standing up straight. Again, see what a great bra can do for your figure. 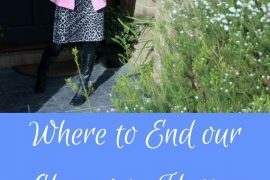 You will find tops that drape past your body really make a difference. Anything that clings won’t flatter. 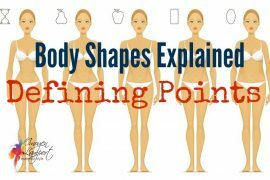 If you feel you need to put a horizontal line on your body, make sure it’s in the empire position (just underneath your bust) rather than at your waist. If the fabric is at all stiff make sure there are no gathers under the bust as you will get asked about when the baby is due. Layering is your friend, a dark top underneath a lighter (than the top) jacket or cardigan will help make your stomach disappear. Use that column of colour to create the longest vertical line you can. Keep patterns dense, but larger scale. Ruching is your friend. Ruching in a top can help to hide a myriad of secrets. Tunics can work really well with skinny jeans on your body shape, especially if you have great legs. Tuck your skinny jeans into knee high boots to balance your upper body. Patterns (especially when dense and low negative space) can help to keep the eye moving and not draw attention to your body. 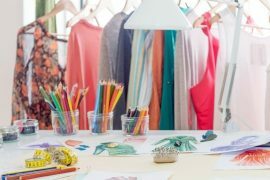 Look for fabrics that don’t have too much bulk, but also those that skim, without clinging, too much lycra in a garment won’t be flattering. Single breasted jackets are best for you. A wider collar can help draw attention up and out. Avoid cropped jackets, you will find jackets that fall no shorter than the hip bone flatter most. 3/4 length can really work. Jackets are great for hiding lumps and bumps, make sure the fabric is not to stiff, that they are fitted, but not too tight. You may find that straighter shaped skirts work well for you, falling from your hips and creating a longer line. Trumpet skirts that flare from the knee can also work. Dresses with a knot just under the bust are a great shape for you. Darker denims, softer denims with some stretch will work better for you than light and stiff denims. Avoid too much distressing on denim, keep it simple and clean looking. Have your pants hemmed as long as possible to create the longest, leanest line. Trouser shape jeans are great, bootcuts also work. 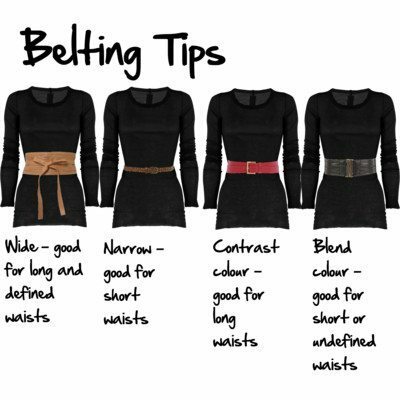 Want to wear a belt? Check out these tips. 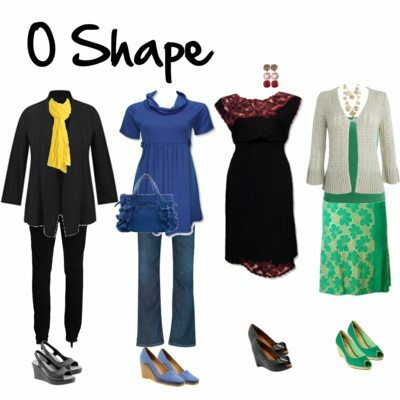 More on dressing your O shape body here and here. Wow. That's me in the lower picture and I am just blown away by the revelation. With my measurements of 40-32-42 – I always considered myself a pudgy hourglass with a deformed tummy. In real life ( a short 6yo took this photo) my shoulders are narrow and I wear a petite jacket, but I can see how my heavy upper arms give me a top heavy appearance. Now I need to rethink everything! 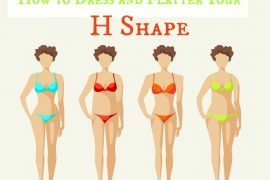 Great ideas for reshaping oneself with fashion and undergarments!! A great bra makes a huge dfference. One other thing I noticed in the lower photo, MM, is that you appear to have a swayback, or more spinal curvature than "normal" (whatever *that* is). BTW, you are NOT deformed – I probably have as much of a protruding tummy as you but my spine has less lordotic curve than yours, so I look more "H" than "O". That was tongue in cheek but not very kind to myself to put it that way–yes, I have quite a swayback. Great advice! Thanks for addressing the O! I needed this post. Can't believe the mistakes I have been making. Thank you for all your trouble. I'm thinking so because I know I'm an apple, and these O tips are really what work for me! Hi Imogenes! I write from the other side of the world, Sudamérica. I just discover your website and I love it, my life change! Im 44 years old, 160 cm, 65 kg, with protruding stomach . I need a wardrobe for a very change climate on one day, especialy cool and windy winter and short hot summer. My style is sometime relaxed or frecuently formal business . 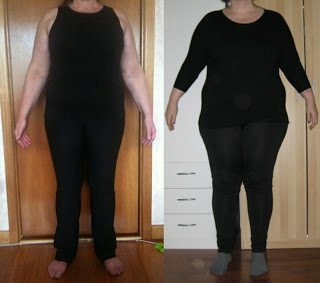 I like sent to you my photos because I cant determinate my shape. (Its H, O?) When I was slimer are diferent, but now I cant find the waist and the widest point . My other big problems are my too big ankles. For this cause, always use long dark formal pants. I need ideas for change my style, now is too boring. I’m a little confused. 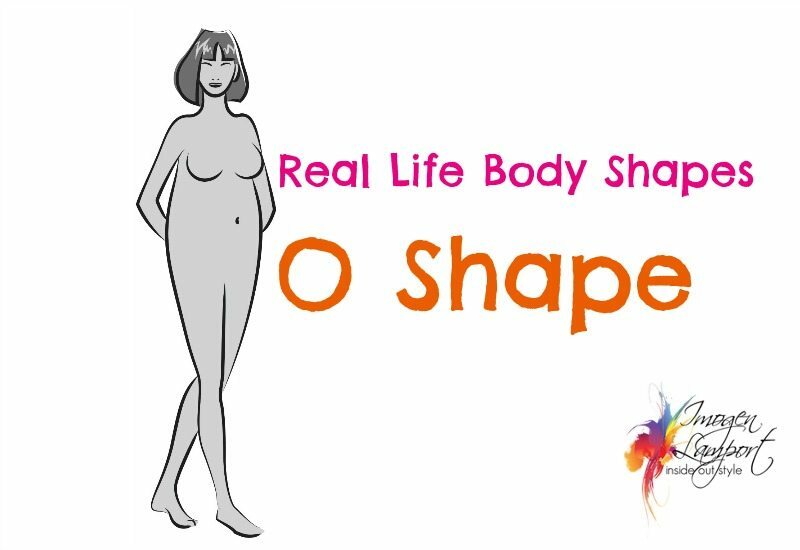 Is O basically the overweight version of any other shape? I thought I was an A from the front but sideways my belly sticks out a lot so am I an O then? Sarah – no an O is an overweight H, 8 or V, an A can just go up and be larger but remain the same shape. This article says to send in your picture if you think you are an O but I can’t figure out how. Your contact me form doesn’t have any way to attach one. Is there an e-mail address? Thank you. I’m also interested to send in a photo. Please let me know how! Email it to me or you can upload one of Facebook via the messages option on my BesokeImage facebook page. So a person can have combo shapes? I didn’t know we should also factor in our profile shape! I do think I was a V when I was thinner. My shoulder to hip ratio was and still is large, but now I’m carrying a lot of weight everywhere. It’s most notable when I’m in profile. I have a large bust and tummy and flat back. If you’re a combo V and O shape what style guidelines should one go by the most? I suppose it’s a compromise of what you want to flatter and hide the most? Thanks for your response Imogen! I’m wondering though… what are your thoughts on someone with a V-O combo wearing skinny jeans or leggings? Would they be suitable for this shape maybe wearing some sort of tunic top?